Mountain climbers visit Cloud Cap Inn, circa 1930. Ralph Eddy photo courtesy of Stephen Kenney. 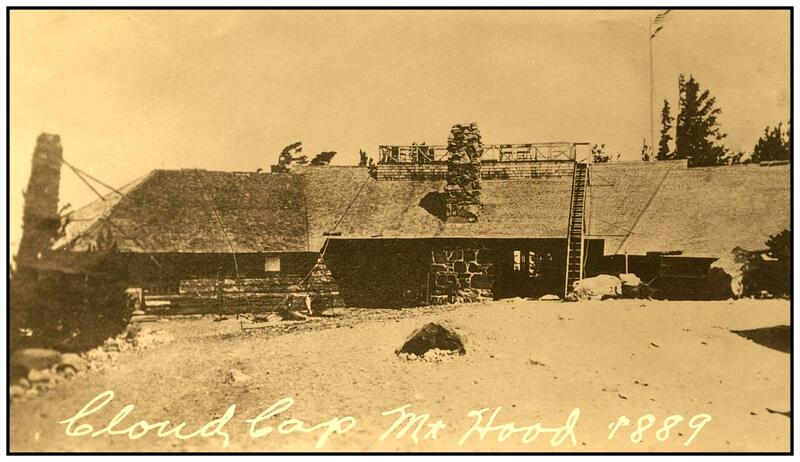 This view shows the newly completed Cloud Cap Inn in 1889. Designer William Whidden designed Portland City Hall, the Portland Hotel, the Multnomah County Courthouse and a number of prominent buildings in the Northwest. Photo courtesy of Stephen Kenney. Prior to building the Inn, Ladd bought the road and created the Mt. Hood Stage Company. The road needed improvements before building could begin. Ladd and Wood started to make improvements to the road near the town of Mt. Hood which is about 15 miles above Hood River. They hired Chinese laborers to dig and fill the grades of the road all the way to the timberline level. Just below Cloud Cap Inn there is a spot with a 22 percent grade on a curve over a small ravine that was named “China Fill” and it was a challenge to early vehicles making the trip. The original road ran along the ridge between Evans Creek and Crystal Springs Creek. Parts of the original road are still visible. A forest camp was established and work on the lodge began, with its heavy log walls, thick cedar shake roof and two mammoth fireplaces of stone. Cables were fastened to buried foundations to keep the structure from blowing off the ridge. Water was piped in 1,200 feet from Tilly Jane Creek. 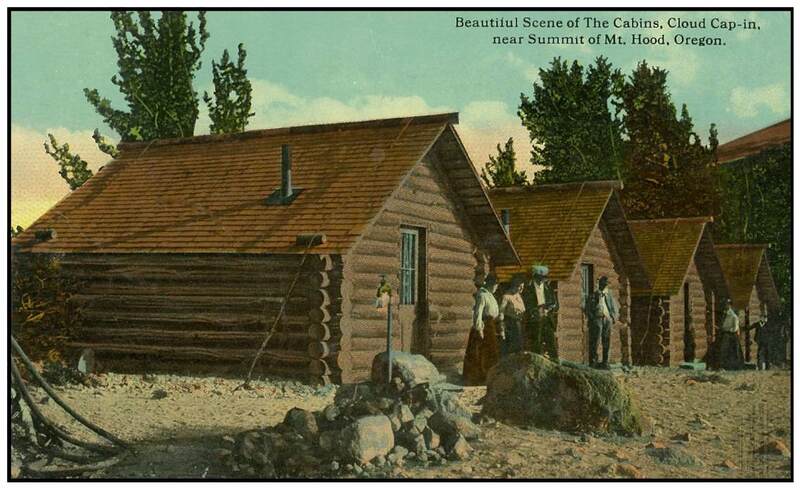 Most of the work of building the Inn was done by crews of men recruited from Hood River, creating a local work force who felled the timber, cut the lumber and built the Inn which featured fine dining, flush toilets, room to sleep thirty guests and a gasp-worthy view of the 11,239-foot summit of Mt. Hood. 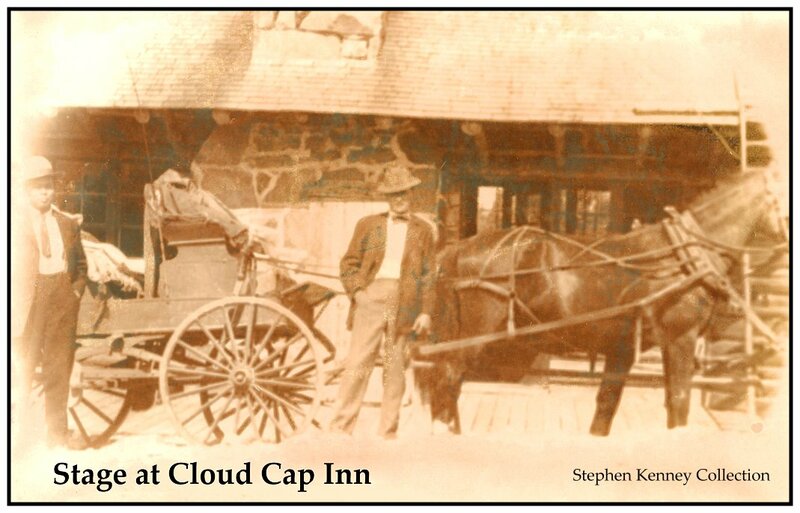 After the kitchen was complete, and the baths and beds were installed, Cloud Cap Inn officially opened for business on August 3, 1889. The official grand opening was held three days later on August 6, 1889. 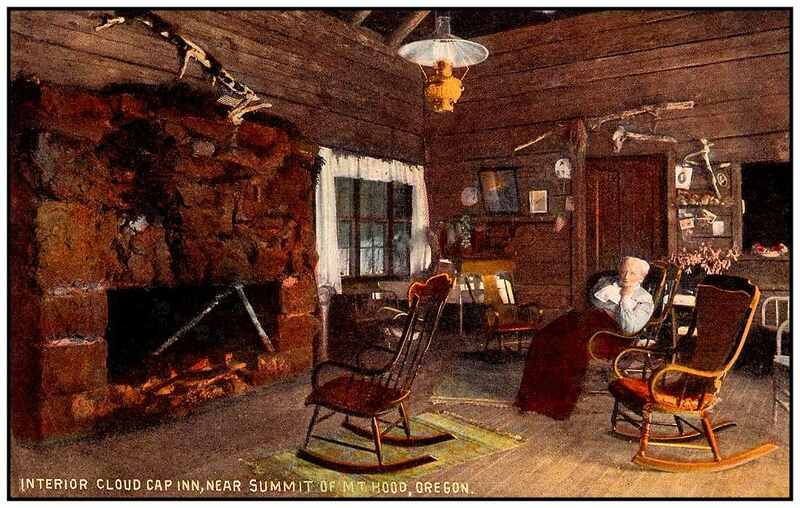 The trip to Cloud Cap Inn usually started with a 60-mile train ride from Portland to Hood River. The horse-drawn Mt. Hood Stage took passengers from Hood River to Cloud Cap where they arrived five and a half hours later after a stop for lunch and several horse changes at livery stables along the way. Business was slow in the beginning, with the August opening that first year, and few people were willing to make the 27-mile trip from the train depot in Hood River. Only 88 visitors experienced the fine dining and luxurious décor of the Inn that first summer. The roads were usually closed by snow in late September or early October. It is not uncommon for Cloud Cap to see 60 feet of snow in the winter. In 1891, Ladd and Wood turned the Inn's operation over to Sarah Langille who gave it a homier feel and she able to operate the Inn at a profit. Sarah Langille, (pictured above), began managing Cloud Cap Inn in 1891 with the help of her sons Will and Doug, who were mountain guides. In 1894, Ladd bought telephone wire and equipment to install a phone system at the Inn. Will Langille oversaw the installation of the equipment and the hanging of the wire. Several years later, Will left Oregon to join the Alaskan gold rush. Doug stayed on as a guide until 1900 when he joined the U.S. Geological Survey. Sarah’s nephew, Horace Mecklem came to help out after her sons left. Sarah then hired two European guides until 1903. Mark Weygant went to work for Sarah in 1904 and worked for her for several years. Sarah retired from operating the Inn successfully for 16 years in 1907 and turned operation over to Horace Mecklem and his wife Olive. In 1906, the Mt. Hood Railroad was built, taking passengers from Hood River fifteen and a half miles to the town of Dee. In 1910, the railroad was extended to Parkdale for a 22-mile trip. The first automobile to be driven to Cloud Cap arrived in 1907. It was a one-cylinder Cadillac. Afterwards, Mecklem operated a Pierce Arrow as a stage from Hood River to the Inn. This western view also shows the cabins that were built south and west of the Inn. Cabins were built to house workers at the Inn. Due to high winds, the cabins were tied down to keep them from blowing away. Some of the tie down anchors for the cabins are still in place today. 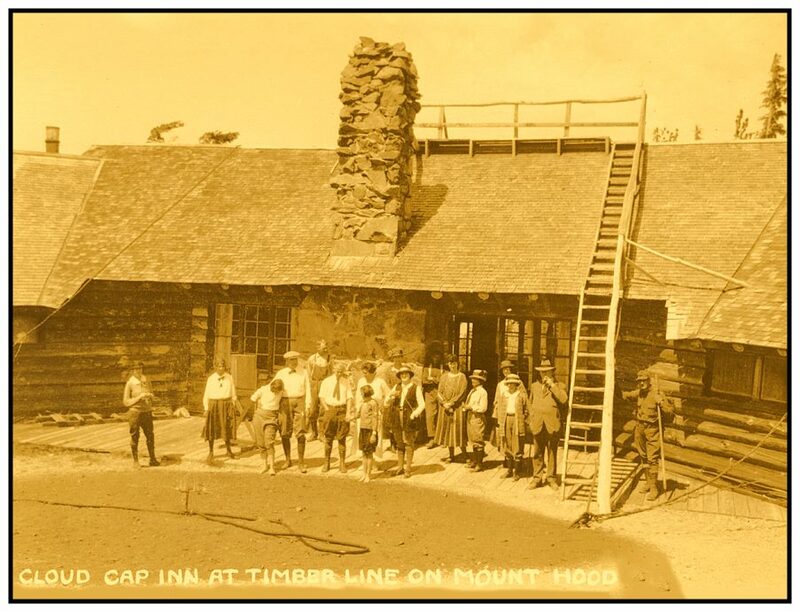 This view shows Cloud Cap Inn in 1910 with visitors on the observation deck and ladder. Photo courtesy of Stephen Kenney. Dorsey Smith assumed the operation of the Inn around 1910. Homer Rogers, who ran a lodge in Parkdale, bought the Inn in 1919 from Ladd for $5,000, and he signed a long-term contract with the Forest Service. In 1925 the government was planning the Mount Hood Loop Highway and considering building a newer and bigger inn, similar to Rainier’s Paradise Hotel. They pressured Rodgers to make improvements to the road or lose his permit. Homer ended up selling the Inn to a group of people headed by J.C. Ainsworth. They hired Dorsey Smith to operate the Inn temporarily. A new road was built in 1926 to smooth out or avoid some of the more challenging stretches of the stage road. In 1927, Dorsey Smith turned the Inn’s operation over to Noyes Tyrrell, who operated the very successful Tyrrell’s Tavern near Bonneville. He ran it until 1932 when it stood empty for about a year. The plans for a new Grand Lodge didn’t bring the funds needed by private investors. Enthusiasm for the project was briefly renewed when the Mt. Hood committee came up with plans for a tramway to the summit of Mount Hood. But opposition from the Mazama climbing club and groups concerned with the environmental affects and safety killed that project too. 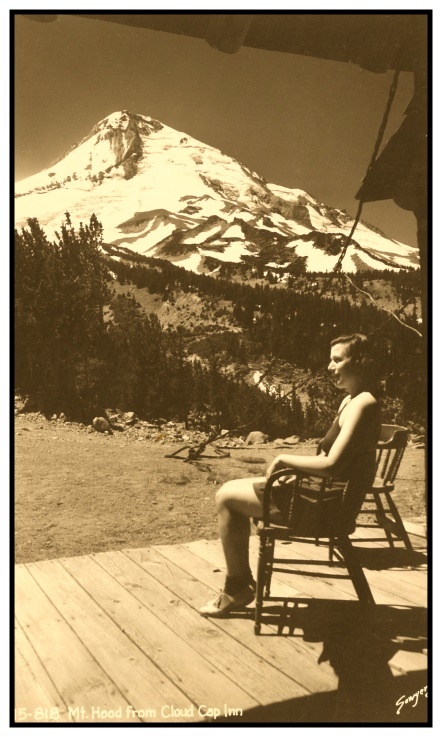 The Great Depression dashed that dream, and once Timberline Lodge was built in 1935, Cloud Cap could not compete. 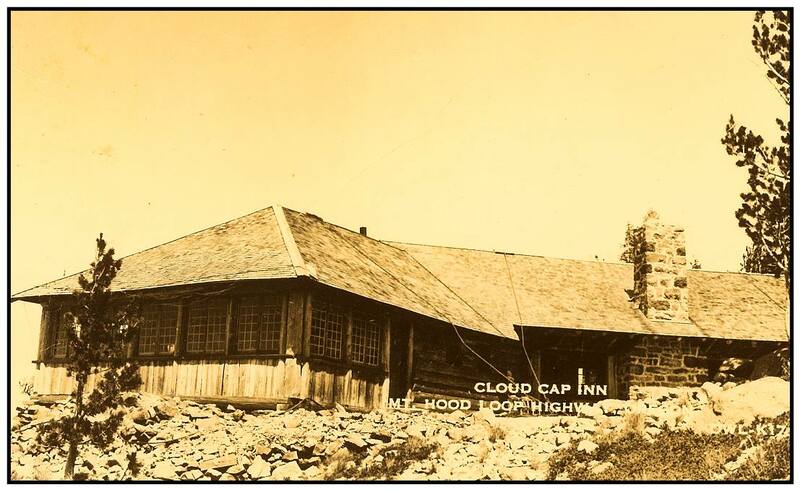 This view shows Cloud Cap Inn in 1935. Photo courtesy of Stephen Kenney. Boyd French Sr. leased the Inn around 1934. Open in late spring and summer only, Cloud Cap operated until the outbreak of World War II. Cloud Cap was sold in 1942 to the Forest Service for $2,000. Dorsey Smith was the representative in the transaction, ending his long association with Cloud Cap. Boyd Smith used the Inn as a part time residence until after the war. It operated briefly in 1946, the last time as a hotel. Hunters and vandals took their toll as did the weather as the doors were allowed to remain open to the storms of winter. The Forest Service considered tearing it down in 1950 as it had fallen into disrepair. In 1954, the Hood River Crag Rats Mountaineering Group offered to fix it up and maintain it if they were given a permit to use Cloud Cap as a base for their snow survey program and mountain rescue. The Crag Rats went to work repairing the building and they still maintain it to this day. 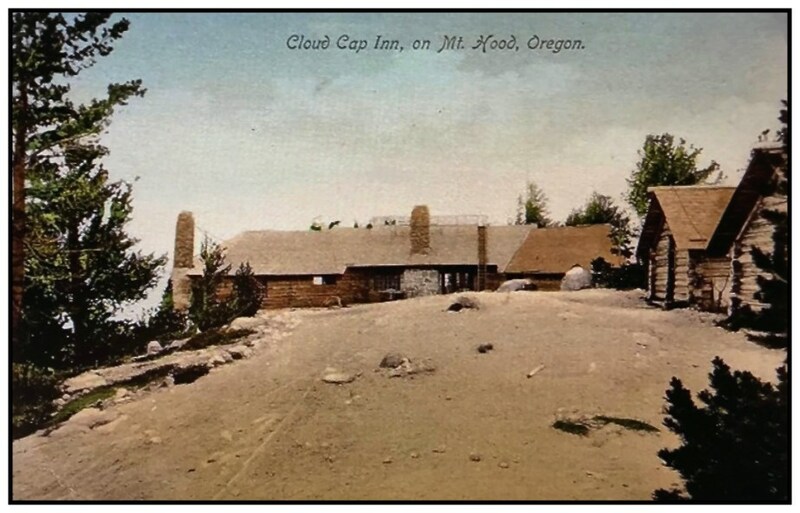 Cloud Cap Inn was placed on the Register of Historic Places by the state of Oregon in 1974. Cloud Cap is still accessible after the snow melts via a 14-mile gravel road by the Cooper Spur Junction. Tours can be arranged with the Crag Rats and you will find it open on some weekends in the summer. 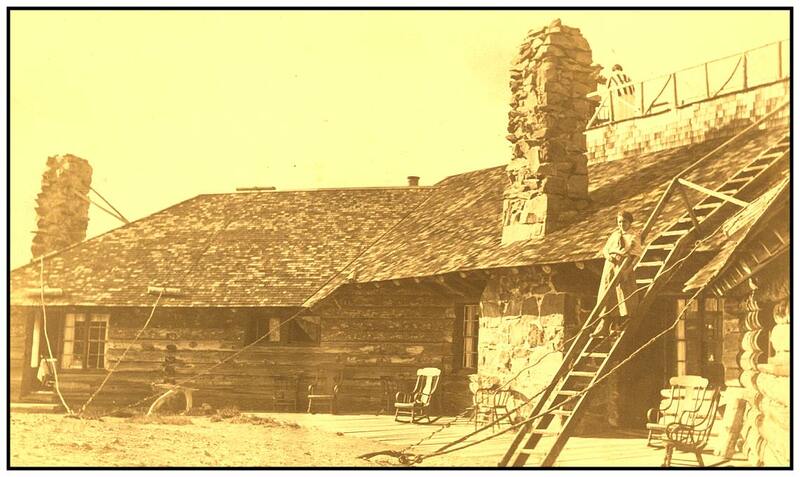 It was the first permanent resort built on Mt. Hood and it is the oldest surviving structure on the mountain. View of Mt. Hood from Cloud Cap Inn. Photo courtesy of Stephen Kenney.